Please choose the type of tour you'd like to book below and proceed to the request to Niagara tour booking form. Please Note that if you are looking to book a tour for one person, we will try to do our best to accomodate, however most tours do have a minimum booking of 2-4 people. Please contact us for solo tour booking inquires! Let us whisk you away on a guided passenger tour of 20 Valley or Niagara-on-the-Lake wineries, breweries and culinary delights. All passenger tour options are available to choose on the request to book form. 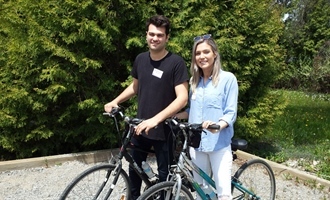 Choose from our guided or self-guided Niagara-on-the-Lake bicycle wine tours. Please note that when we call to confirm your booking we will ask for each guest's height so we can reserve the proper bikes for your party. Looking to rent a bike to tour around Niagara? Please note that this form requests your guests height so we can make sure we reserve bikes that will fit each member of your group. Do you need a custom tailored wine tour for your special event? We'd be happy to help make your day extraordinary by creating a unique and memorable event for any occasion.